A while ago I did a blog post on the gorgeous Pureness necklace that I bought from the German glass artist, Melanie Moertel. 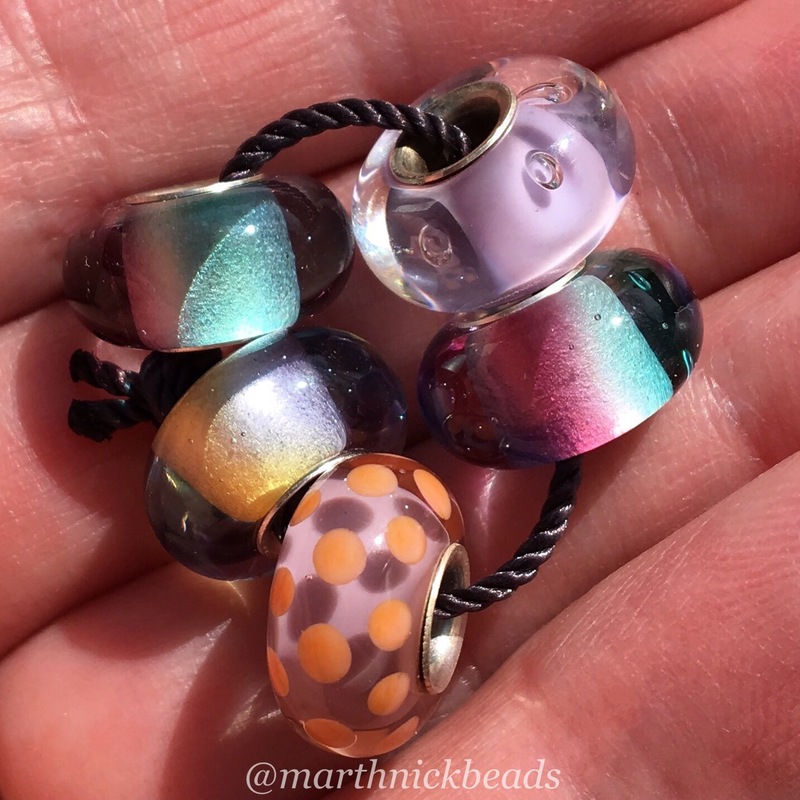 She very kindly sent me some of her new glass beads and I was blown away by how beautiful they are! They can be found at her online store here. The three transparent ones are called ‘Underwater Armadillos’ and indeed they really look like water or watercolours. 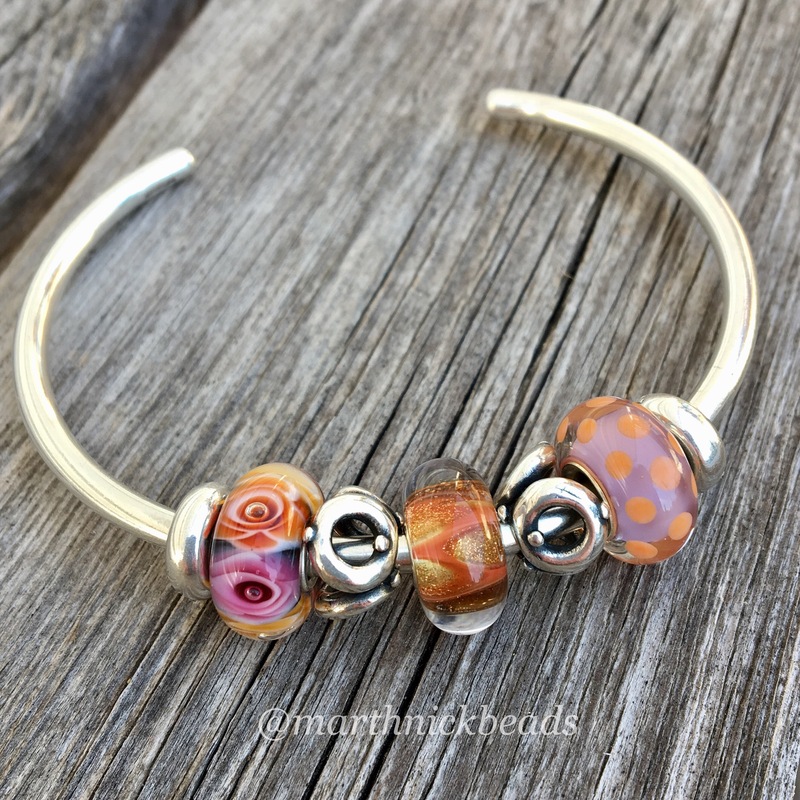 The polka dotted one matches really well with the Trollbeads Roses for Mom and Love & Laughter. I wore this bangle and couldn’t stop staring at it. 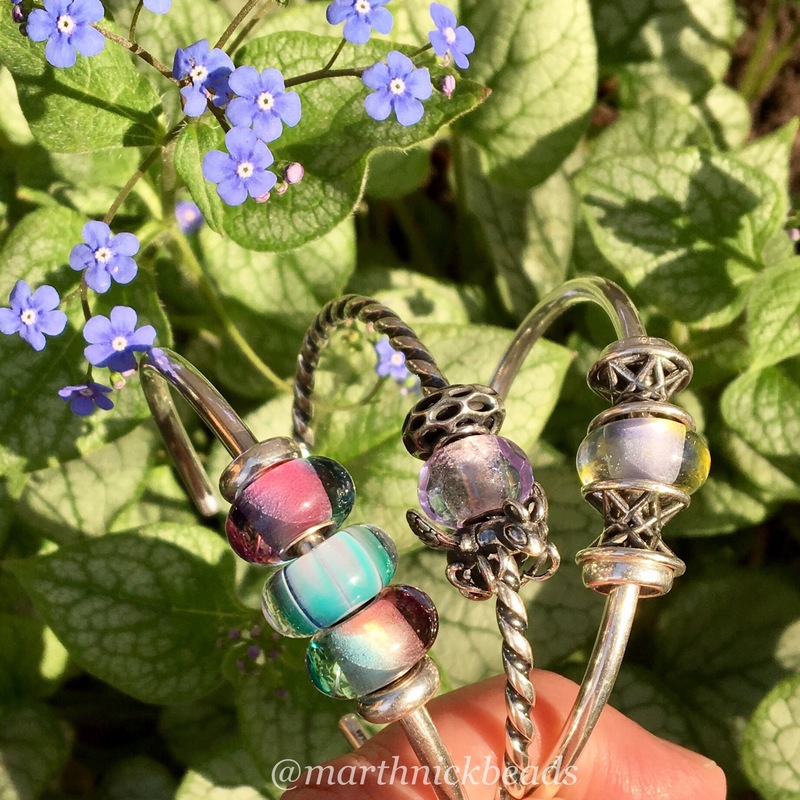 The one in the middle is a Trollbeads Unique. The violet and yellow Underwater Armadillo is beautifully subtle. You can see a reflection of the pansies in the glass. Here’s a trio of bangles in a couple of different kinds of light. 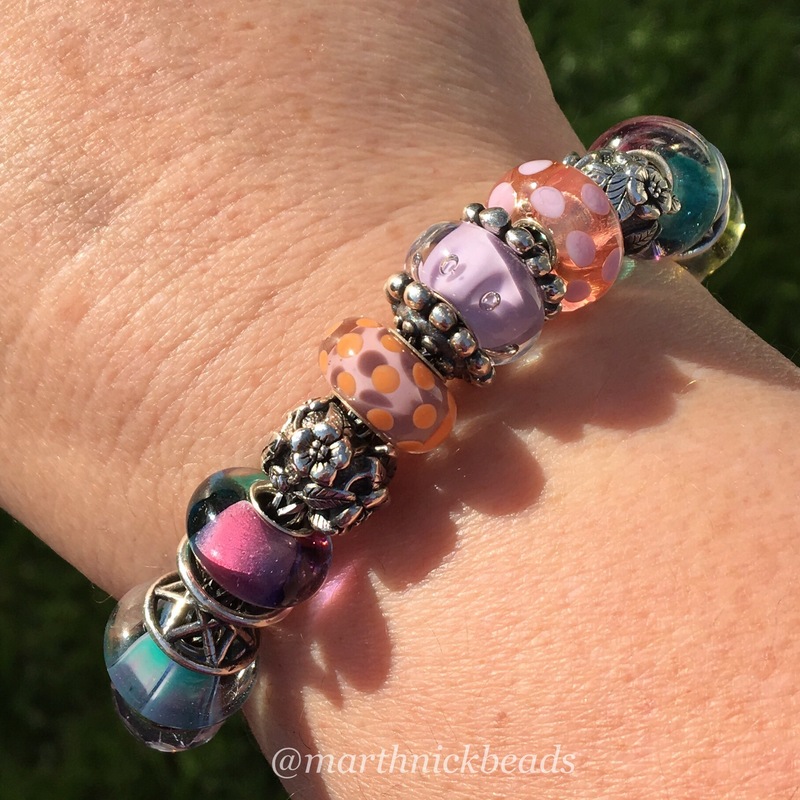 The Lavender Prisms look so lovely with these beads, so I made up a full bracelet. 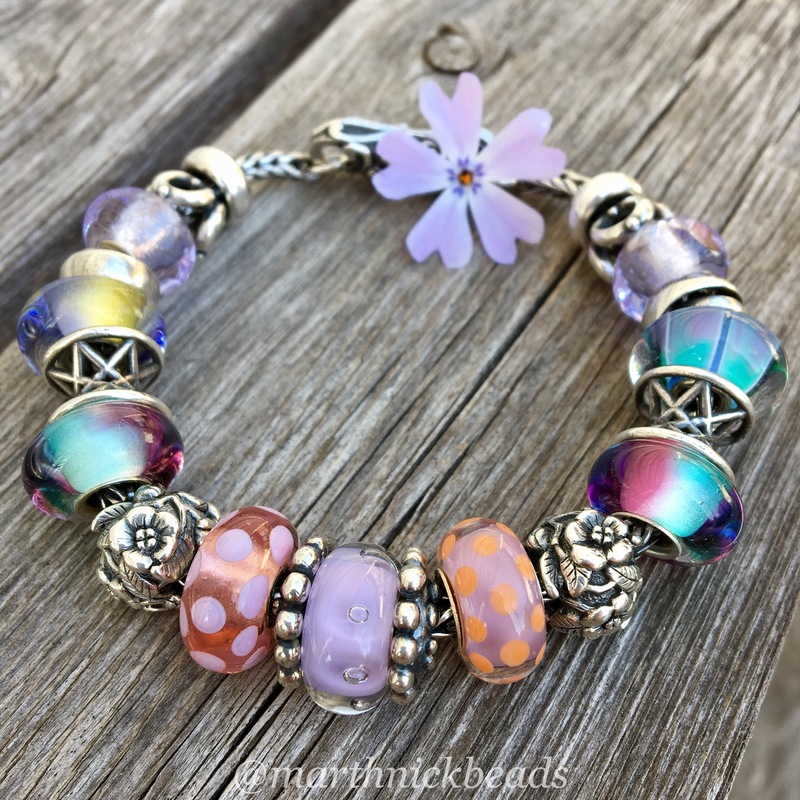 I love how the Silver Sakura Spiritbeads look on this bracelet and the Lotus Tops play off of the polka dotted beads. 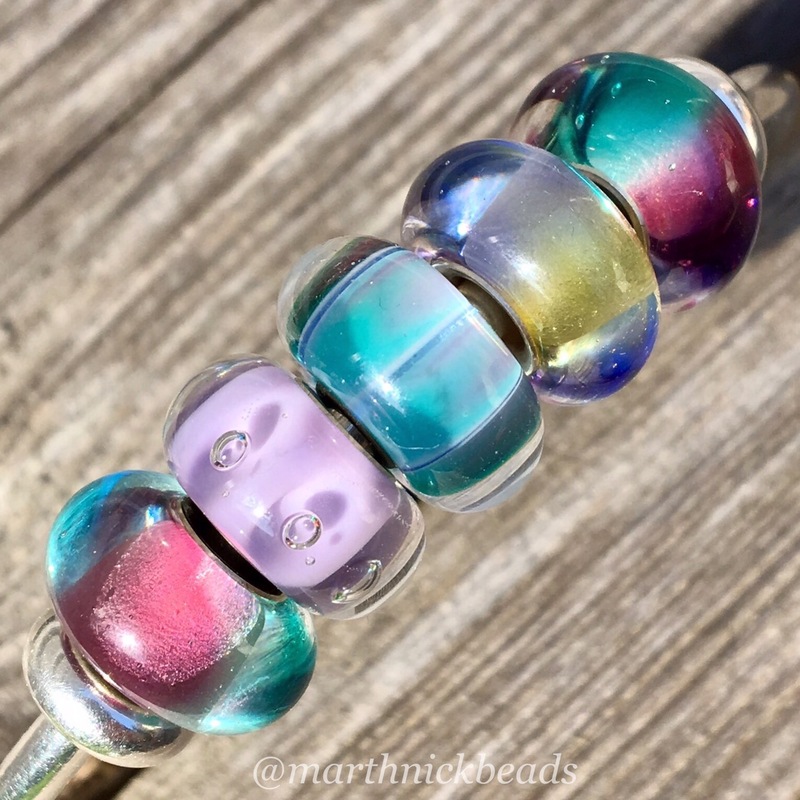 Because these beads look so glorious in the sun I made a little video that moves them from the shade to the sun so you can see the changing colours. I’m wiggling my hand around a lot-you might get queasy! I’m going to leave this post with a couple of flower pictures. 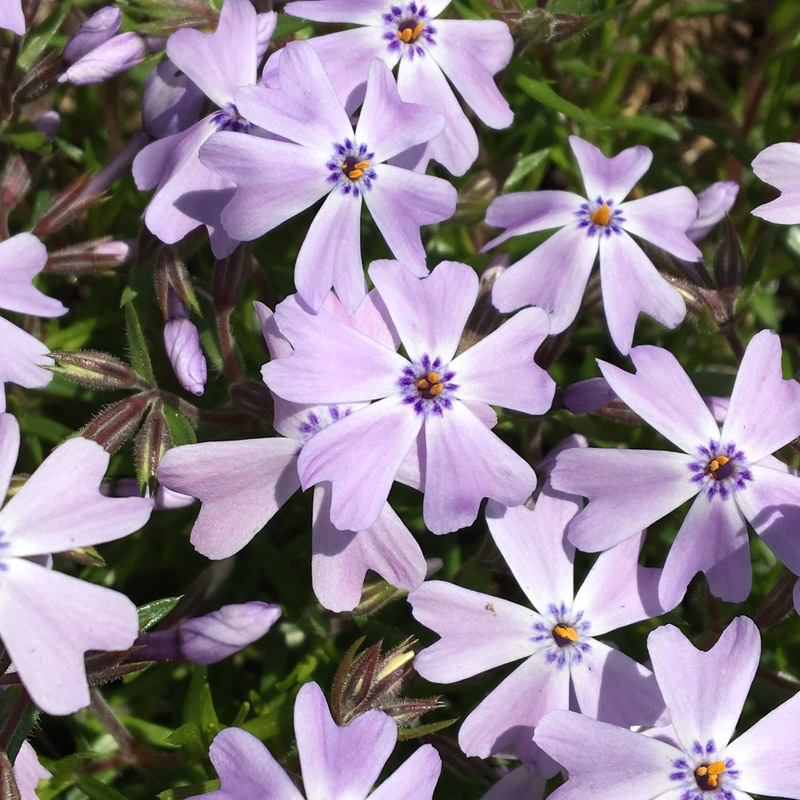 With springtime, flowers bring me a huge amount of pleasure and I hope you enjoy them too. I also hope you’ve enjoyed this look at these gorgeous beads. They have a 4mm core and also fit on Pandora bracelets. I hope Melanie keeps making glass beads because I would enjoy seeing other people’s pictures of them! Feel free to comment with your thoughts! Coming up next week will be an overview of the different colours of the upcoming Universal Unique Leather Bracelets from Trollbeads (there’s a photo on my Facebook page) and then the Ohm Beads Strawberry and Butterfly beads. Have a great weekend! Hi Alex! I love how the light reflects on them also. I can’t tell you how much I’ve been looking at my wrist the past couple of days! 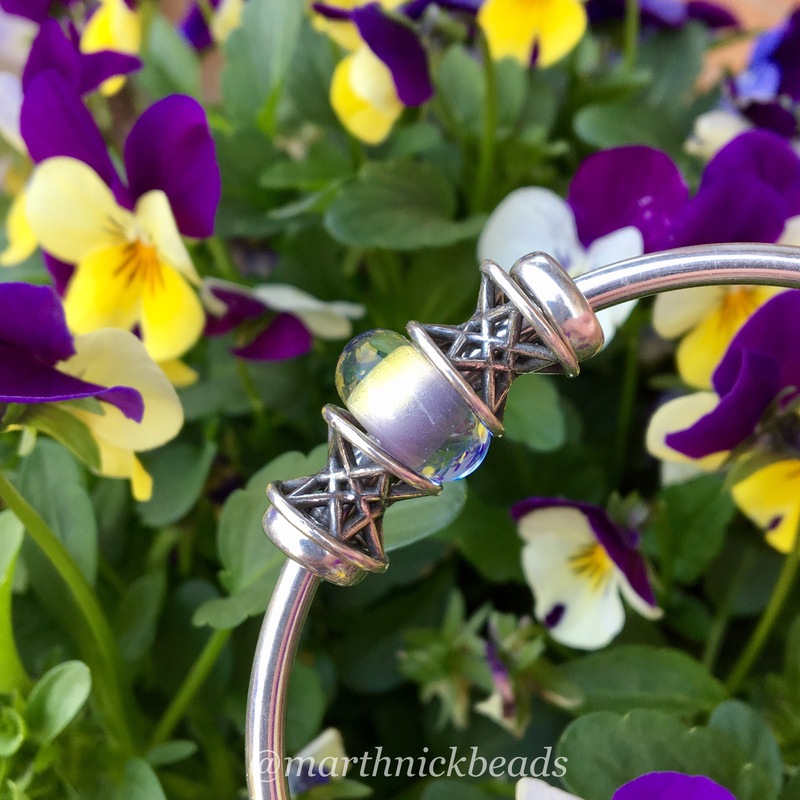 I forgot to mention in the blog post that I also really like how well they fit in with Trollbeads, due to the size. For sure. I wish more people would make polka dot beads! Fun for the summertime! 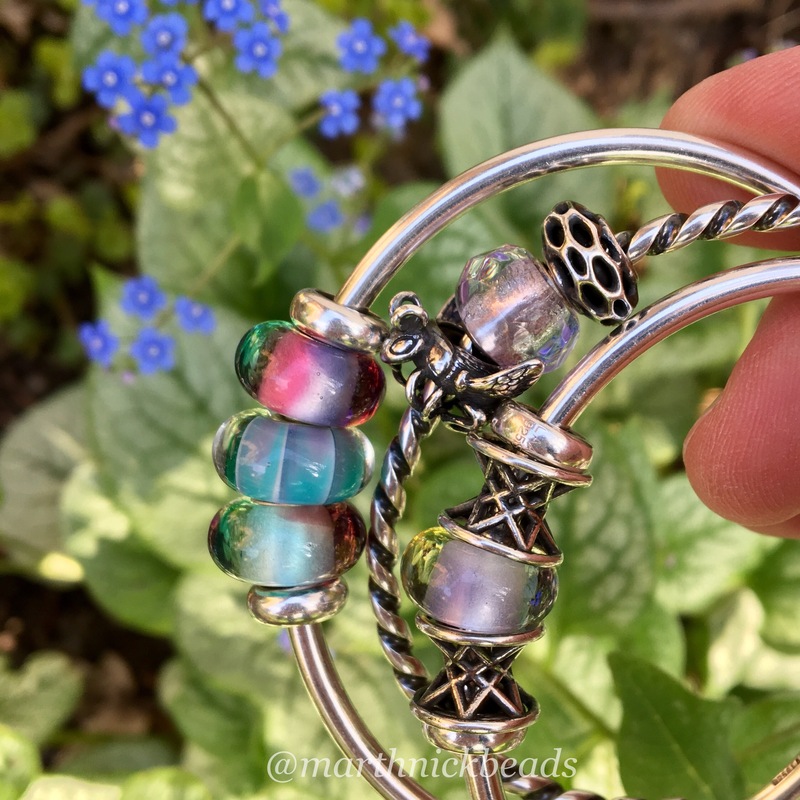 Hi Martha, I really love your your bangle with the Trollbeads Unique and the Underwater Armadillos. It is just gorgeous! I would be staring at it too if I was wearing it. Hi Suzanne! Thanks, I love it too. It really catches the light in beautiful ways! Somehow I forgot to mention that I love your flowers! 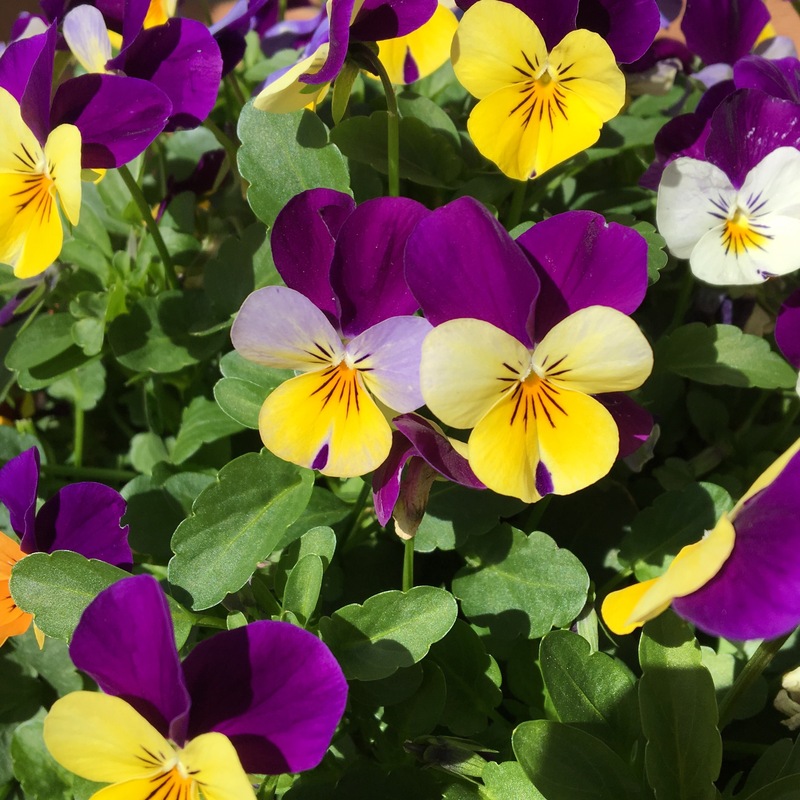 I have tried to grow pansies in the past but just couldn’t manage to get them going. Ah! I just bought this pot with them already grown, as I am a terrible gardener. I do love colour in the garden, though! These beads are so beautiful! Thanks for sharing her work with us! My pleasure! They are so gorgeous! I meant to look at. I am enjoying your whole sight. Since I’m a new bead addict, it’s interesting to see all the ideas and other brands, too. Ah! Great! Yes, there are a lot of brands of beads now and it’s fun to mix them up sometimes.